The Boisset Collection Ambassador Program is part of the Boisset Collection family, headquartered in St. Helena, CA. The Boisset Ambassador Program is a direct-to-consumer marketing program offered through a network of independent Wine Ambassadors (independent agents) for Boisset Collection. Our brand ambassadors promote and share information about the wines, but do not sell or carry wine inventory for sale. All wine orders, including tasting flights, are shipped directly from our licensed wineries (Buena Vista Winery, DeLoach Vineyards, JCB Wines, Raymond Vineyards, Wattle Creek Winery) or our authorized shipping companies. Each state has different laws pertaining to the direct shipment of wine to consumers. Below is the list of our current state of operations and the applicable limitations by state in volume, which is subject to change without notice. For a comprehensive list of direct shipping state laws visit the Wine Institute website. This information is also posted in the Resource Center as a PDF under Marketing/Shipping and can be found here. Can only ship Buena Vista, DeLoach, JCB, Lockwood, Lyeth and Wattle Creek wines. Shipping of Raymond, Frenchie, LVE or "Imported" wines is prohibited. 12 cases per individual per year. 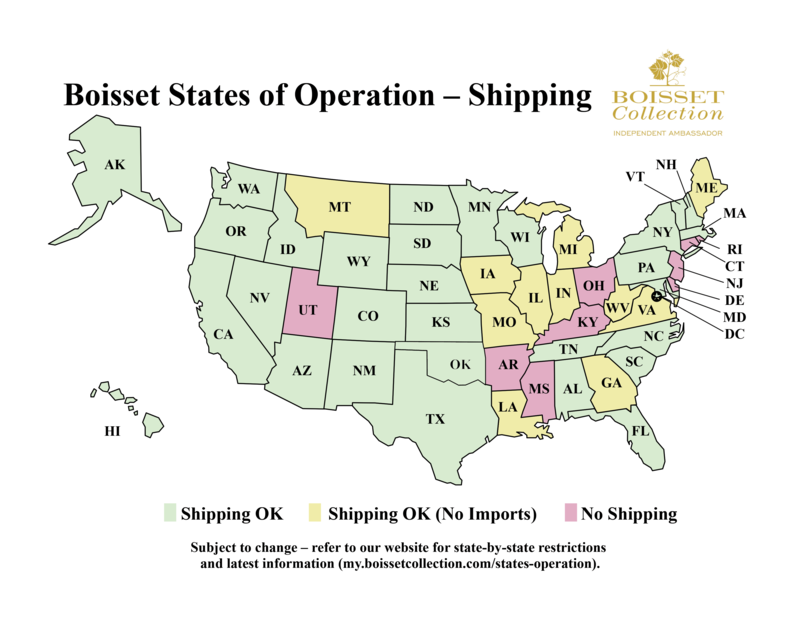 Boisset cannot ship any wines that are in distribution in this state. Shipping of "Imported" wines is prohibited. Please contact your Ambassador or Customer Care for assistance with your order. If you have questions about our business model, shipping, compliance, or the Boisset Collection Ambassador Program, please contact Customer Care or call 1-855-233-5155 x 2.